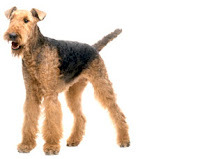 Quite a pleasant breed, the Airedale Terrier is protective, brave, and affectionate. It demands love and attention. Sometimes a rowdy breed, the Airedale Terrier should start obedience training at a young age to avoid dominance issues and to ensure the dog will be well mannered.